A steely wind off Bohai Bay blasted down the streets of Da'an. Despite the inclement weather on a recent Wednesday morning, a steady stream of villagers appeared at the doors of the Communist Party headquarters in this community of some 3000 located just outside the northern port city of Tianjin, patiently waiting for their chance to cast a vote in triennial elections for the village's chief administrator and his two assistants. 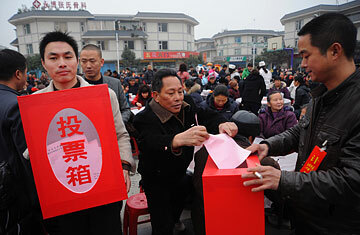 China has been experimenting with various forms of direct elections at the village level for decades. In the last ten years, the polls have reached almost every one of China's over 600,000 villages. Urban residents have no direct elections, and all other official positions above the village level are indirectly elected in polls over which the ruling Communist Party maintains strict control. Although the village elections are still dismissed by some critics as an attempt by the Party to be able to show direct democracy in action in China without conceding any real power, they have received the growing endorsement of one key electorate: the villagers themselves. "When we first started out only a few people would show up to vote," says Can Rongxi, the local Communist Party Secretary helping supervise the polls. "But gradually more and more people came as people realized they had the right to vote and wanted to use it. Now we're holding our fourth elections and we expected 80 to 90% of voters to participate." What's happening in Da'an reflects a rising trend of participation by China's rural voters, some 450 million of whom reportedly cast ballots in 2008. And whatever the reason the elections were started, they are proving to be a godsend for the government as the world financial crisis hits home in China. Even before the crisis, government officials acknowledge that tens of thousands of clashes occur every year between disgruntled Chinese and the authorities over issues like land rights and official corruption. Now, with millions of migrant workers unable to find jobs in the cities and forced to return to their rural homes, village administrators' duties will swell in importance, and the fact that they are directly elected will help to divert anger at administrative shortcomings and other problems away from the Party, something that will be especially welcome to cadres at a time when many returning migrants may not be as willing to unthinkingly accept orders from above after the relative freedom they enjoyed while working in cities. "The people who have spent a long time in the cities are going to have a heightened sense of participation," says Yawei Liu of the Atlanta-based Carter Center's China Elections Project, which has spent years monitoring the evolution of the village elections. It also will give returnees a greater chance to participate themselves. "If you go back you are more likely to want to be a player," says Liu. These elections provide a means of being one. Villages are the smallest unit of administration in China. They are also the frontlines in the Party's battle to keep it's grip on power and to stop the social dislocation caused by years of frenzied economic growth from becoming a serious threat to social stability. China is notorious for its lack of a social safety net, with hundreds of millions of peasants lacking even basic health care, much less luxuries such as unemployment benefits or pensions. Now, faced by soaring unemployment and an accompanying rise in poverty, Beijing is scrambling to put in place measures that will ease the pain for the newly impoverished. Some 16 billion dollars has been budgeted by the central government for health and education in the coming years, and its chosen method of distributing the money is often those same village committees. "The push is on for rural community development centers that include such things as health care clinics, deciding who qualifies for government relief, conflict resolution centers, libraries, even sometimes a small supermarket," says Liu. "This anticipates the return of the migrant workers so that they will feel they are being taken care of when they go home." Back in Da'an, one middle-aged voter says he once left this village because local corruption and mismanagement brought his company to the brink of bankruptcy, forcing him to look for work elsewhere. Now, he says, he's come back to Da'an in the hope his vote will help put the village on a better path forward. "Of course I'd come back home just to vote," he says, declining to give his name. "This is a big deal for my village. The leadership was so disappointing that it drove me away. I can't wait to see a new village leader who can help change the situation." At a time when millions of other like him are returning to their villages with similarly bitter memories and high expectations, Communist Party cadres must be delighted that they have put in place a system where, for once, someone else can take the blame when things go wrong. See pictures of China's dust bowl. See 10 things to do in Beijing.